Great fishing experiences rely on plentiful fish stocks and healthy and productive aquatic ecosystems. This is especially true in estuarine environments, which act as nursery habitat for many key fishing species as well as a lifetime habitat for others. 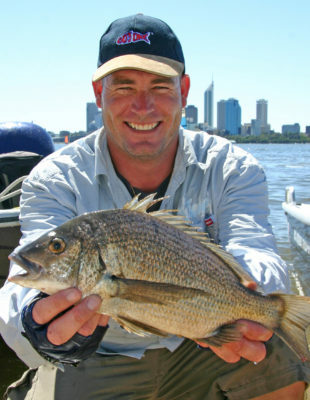 Murdoch University have been working on a project to improve the recreational fishing experience in the Swan River Estuary by providing and restoring complex habitat and prey communities with funding from the Recreational Fishing Initiatives Fund. The health and habitat of the Swan River Estuary System is extremely important for its inhabitants and the community who access it. A habitat that provides shelter for fish, as well as acting as an attractant for prey communities is what sets the scene for a healthy and self-reliant eco system. In turn, it can improve the overall health of the system which will in turn, improving recreational fishing experiences. 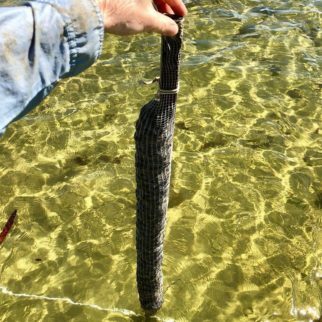 Earlier in the year, Murdoch began part one of the project by cleaning and re-snagging existing habitat in the upper Swan River to align with the expected mussel spawning cycle. The newly hatched black pygmy mussels, called spat, attach themselves to the clean snags, increasing important prey communities for black bream, thereby improving the breams growth rate, body condition and therefore enhancing the recreational fishing experience. A short video of this project can be viewed below. The second part of this project has commenced this week, with the deployment of a mussel reef, the first of its kind in the Swan River Estuary System. Not only will this reef increase the diversity of habitat around the flats in the estuary basin, thereby attracting fish through provision of greater food abundance and diversity as well as shelter, it will also improve the general health of the Swan River in that particular location. The mussels, filter feeders by nature, are already attached to these reefs and will immediately begin to consume plankton and non-living material from the water column, in turn improving light penetration and growing conditions for aquatic vegetation plants. ‘’Mussels can positively affect an ecosystem by its capacity to filter water and greatly improve the health of the water system in which they inhabitant.’’ Project coordinator Alan Cottingham says. You can see the difference they make in a tank full of water here. Local volunteers have been enthusiastically putting their hand up to engage in the project, assisting in the restoration and deployment components whilst raising awareness of the importance of environment quality for fish stocks. Check out the reef’s deployment video below all made possible with help from volunteers from the Marine Men’s Shed, Murdoch University Dive Club, Murdoch University students and other local volunteers. Reef locations are yet to be announced. This trial project will explore the potential for scaling-up of such projects, providing valuable evidence to support future habitat enhancement and restoration projects in other estuaries. You can read more about this exciting project by visiting the RFIF page – Swan River Habitat Restoration. Or become a volunteer and help out by clicking here.